Go to Auto-Pilot under Marketing in your Socioh dashboard. 5. Click on ‘Edit Marketing Plan’ in the top section. 6. You’ll now be able to edit the time, frequency, and text under Social Channels Settings by going to the channel that you'd like to make changes for. 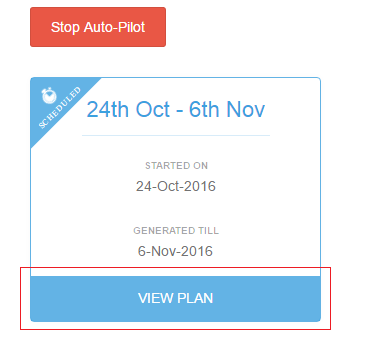 In case of Auto-Pilot, at the end of the first week, the next weekly plan is generated and so on. This plan will become active only when the current plan ends. You will be able to edit the next weekly plan since it’ll be in a scheduled state. How can I end an Auto-Pilot campaign?